The Local Handcraft Association operated the handcraft shop at 2 St Johns Ave. Gordon (and previously at Roseville), on Sydney's North Shore, for 38 years. Located opposite the entrance to Gordon Station, and alongside the station's car drop-off and bus stops, we were familiar to North Shore commuters for many decades. Since the Gordon shop closed in 2010, we have maintained our forty year tradition by selling our crafts at regular stalls held in local shopping centres, as well as through this website. Our shop always traded with the motto of "come in and meet the makers", and that remains true today, our customers still come along to meet us at our regular stalls. 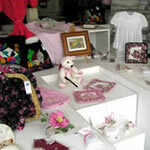 You can also contact us by mail, phone or email and you can browse our crafts on this website. Currently, we use both of the major local shopping malls - St Ives Shopping Village and The Gordon Centre - for our regular craft stalls. Many of our faithful customers came to say "Hello" and to buy our lovely craft. Details of this year's sales are on this website, and you can also keep up to date by joining our email list. We will send you an email about a week before each sale. 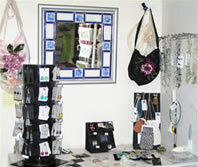 Please note that our membership has seen some changes over the years, so that some of the items seen in the photos on this page (which were taken in the shop in 2006) are no longer available through The Local Handcraft Association. If you do spot something in these photos that you'd like to have, and it isn't listed amongst what we now sell, then please contact us - if possible, we will put you in touch with the maker.